Establishing criteria for individual nibs is a highly subjective matter. It boils down to one’s personal writing style and the type of penpoint that works best. Simply put, what pressure is required with the nib in the holder to make a line of desired thickness? For writers with a light touch, a nib with good flexibility is needed. Those with a heavy hand would prefer a stiffer pen to achieve similar lines. The reader has to decide where he or she falls. The type of script one writes is also of paramount importance. Those who prefer ornamental script (artistic writing) generally want a nib that is fine and quite flexible for a good “belly” on the capital stem with thick, dramatic flourishes. Copperplate writers might seek a less flexible point that provides a good, even shade. Engrossers’ scripters, who literally draw their letters, tend toward fine and very flexible nibs depending on the size of their letters and desired thickness of the shades. Anyone who engages in business penmanship will probably find pens discussed here unsuitable for their work. They are too flexible and will likely shade a letter on the downstroke whether the writer wants it or not. Gillott’s “Big Four:” left to right, #1 Principality, 604EF, 303, 170. These pens provide a good benchmark through which we can evaluate other nibs manufactured past and present. Understanding your writing style and heaviness of hand is key to finding the best nib for the job. Granted, the most desired vintage nibs are difficult, if not impossible, to find and very expensive when they do turn up. Unless one gets lucky in antique stores or at a flea market (I have been very lucky in both. ), the main source of good nibs will be in a private sale or in some place like the Ebay auction site on the Internet. There are some good nibs made today to suit any script writer. 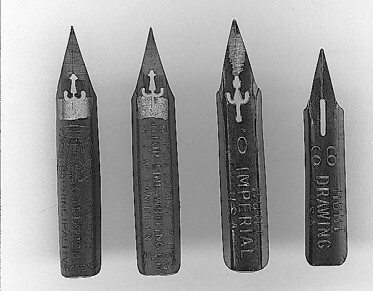 Nibs still manufactured are identified in bold type. 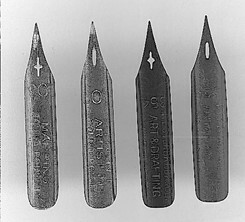 Of the thousands of nib makes and models marketed since the 1830s, the fine and flexible nibs discussed below represent the smallest sector in the pen universe. There weren’t that many made because the market for flexible nibs was not large. Pen and ink artists used some, but the majority went to what Joseph Gillott called “American writing” with its fine lines, bold shades and often bolder flourishes. Spencerian style writing and ornamental penmanship were not popular in England or any other part of Europe in the 19th and 20th centuries. However, Gillott recognized the vast untapped market on the other side of the Atlantic and manufactured nibs for the American writing style. His four most popular fine and flexible pens, the #1 Principality, #604EF (Extra Fine), #303, and #170, provide a fine benchmark for us to evaluate other pens here. A more detailed explanation follows. 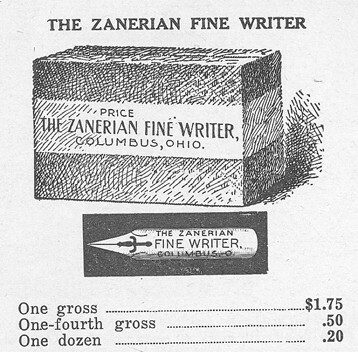 An ad for the Zanerian Fine Writer from the 1928 Zaner-Bloser catalogue. The Fine Writer was a Principality clone, made by Gillott. The $1.75 price for a gross represented the better part of a day’s wages for the average worker in 1928. Everything mentioned in this article is the personal opinion of the author and readers are encouraged to agree or disagree. E-mail and snail mail information is on page two. I have reviewed every nib I could find. However, if someone feels that a nib has been omitted, please don’t keep that a secret. There were many makes and models and it is easy to overlook some, especially those that have not been made in a century or more. Please send a sample for evaluation. Some readers may also feel that a particular nib has been misplaced in a category. Be mindful that nibs loosen up as they are used. Some that do not feel flexible at first become very flexible with use. You may also notice some inconsistencies among nibs of the same make and model. Sometimes within nibs in the same box. Some may feel “softer,” more flexible than others to the point where you might think that the nib no longer belongs in the category it was assigned. You would be correct. Penmakers were very attentive to quality control issues, but the technology available during the age of the steel pen made tolerances for precision work very challenging. Steel pen manufacturing required very precise rolling of the metal, cutting, slitting and stamping during the 4 many steps toward the nib released to the public. For instance, the slightest difference in the thickness of the steel could make a huge difference in the flexibility of the final product. I have begun the survey with the finest and most flexible nibs as they are of most interest to the vast majority of IAMPETH members. It was the many conversations with members at the IAMPETH Convention in Chicago last summer that sparked this series. The complaint was that there was practically no information about nibs available. To my knowledge, the only review of useful nibs to be found anywhere will be in the IAMPETH Newsletter so only IAMPETH members will have it. Hopefully, such a database will provide members with enough information to make informed purchases as nibs, especially vintage points, are expensive. Updates will occur whenever another nib becomes known. As this article will concern only fine and flexible nibs, the next issue will look at pens that are less flexible, but still useful for some work. Following that will be a survey of nibs for business penmanship, though we may only scratch the surface there. The main business of nib manufacturers was regular writing and there were thousands of different pens made specifically for that purpose. We will survey the most popular and the most available now. As mentioned earlier, four Gillott nibs, the #1 Principality, #604EF, #303, and #170 will be the benchmark for evaluating flexibility. Though each will produce a fine hairline, their flex is not the same. The Principality is most flexible by far with the 604EF next followed by the 303. The 170 is very flexible, but finer and smaller than the others. It produces an ultra thin hairline and is great for small lettering. The Principality class of nibs. Left to right: Gillott #1 Principality, Tamblyn #7, Hunt 101 Imperial, Hunt 99 Drawing. This ultra fine, ultra flexible nib was the favorite of Louis Madarasz and Francis Courtney, to name only two past masters of ornamental penThe Principality class of nibs. Left to right: Gillott manship. With #1 Principality, Tamblyn #7, Hunt 101 Imperial, the Principality, Hunt 99 Drawing. a bold shade could be rendered with the mere flick of the wrist. So popular was the Principality that it spawned at least two clones, also made by Gillott. They were the Zanerian Fine Writer and the Tamblyn #7. I have found that the Principality class of nibs is more That shade must adept at making strokes like the capital stem at left with its quick, but thick shade more so than the copalso be consis- perplate “d” to the right. Because of their super flexitent in width. bility, Principality-type nibs aren’t easy to control with This is not an long, straight shades found in copperplate, but rarely, easy task with if ever, in spencerian-type ornamental script. See text ultra flexible nibs for further explanation. As flexible as the Principality was, it was not the most flexible nib. That would be the post World War I Hunt 99, a very demanding pen not likely suitable for beginners. The super light touch required to make this pen work takes much practice. The earliest 99s were very similar to the Gillott 170 (next page), sharper and stiffer than the later model. Look for the small No. 99 stamped on the nib as opposed to the later, large 99 (no No.). I find the Principality class of nibs to be less than terrific for copperplate. Copperplate script demands a longer, somewhat thinner shade (thick stroke) than that found in ornamental penmanship. as the slightest waver in the hand and/or arm will be apparent in the thick stroke. Principality-type nibs were made for the shades in ornamental writing that are normally curved in a more forceful swing of the pen. Nibs such as the Gillott 303 and Hunt 22 don’t re- spond well to the pressure required to make a really thick shade. I’ve destroyed more than one of each in the attempt. An ad for the Spencerian Artitstic, also from the 1928 Zaner-Bloser catalogue. Spencerian pens were made by Perry & Company, Birmingham, England. The Gillott 604EF Class of Nibs. From left to right: Gillott 604EF, Musselman Perfection, Drake Colleges of New York and New Jersey, Esterbrook A1 Professional, Esterbrook 128, Esterbrook 358, Mark Ferth Pens #3, Spencerian #1, Spencerian #5, Sprotts #1, Hunt 56 School Pen, Hunt 20 Century Pen. The 604EF, not quite as fine nor as flexible as the Principality, is a superlative pen. It too, was quite popular on this side of the Atlantic and spawned a few clones, as well. Most notable were the Musselman Perfection and the Drake Colleges of New York and New Jersey (no number), all made by Gillott. Old Hunt No. 99 (left) and later, ca. 1930, Hunt 99. The later nib has the large 99 whereas the earlier pen has the smaller No. 99. The earlier pen is less flexible, but sharper, probably in the Gillott 303 class. Later 99s are super flexible and belong with the Principality-type pens. Another pen of similar age and design was the Spencerian #1, an excellent pen probably more in supply today than the 604EF. However, recent Ebay auctions have seen onegross boxes of the #1 go for over $300. Ouch. The Spencerian line was made by Perry & Sons, who also made the Spencerian #5. This is slightly less flexible than the #1, but a great writing instrument. 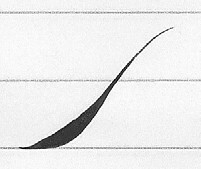 Similar to the Spencerian #1 is the Sprott #1. In my estimation, one of the fin est pens in this class was the Hunt 20 Century Pen, the best nib Hunt ever made. Its flex and snap rivals the Gillott 604 in every way. The present day Hunt 56 is another fine pen to look for. Another pen of exceptional quality was the Esterbrook A1 Professional. For me, this was the late Esterbrook Pen Company’s finest effort and that is saying something about a firm that made outstanding pens of all shapes and sizes. It also rivals the 604EF though may be slightly less flexible. Other excellent Esterbrook pens in this class are the #358 Art & Drafting Pen and the #128 Extra Fine Elastic. These latter two appear to be far more available than the A1, but still in the $1.75-$2.00 per nib class. One more pen to look out for in the 604 class is the Mark Ferth Chilled Steel #3. I don’t know much about Mark Ferth Pens, as the company was called, but this pen is a dead ringer for the Esterbrook 128. The Gillott 303 (modern 303s are blue) is a pen that will produce a finer hairline than the 604EF, but the tines are not designed to spread as wide. As noted in the last IAMPETH Newletter, the 303 underwent some transformations after World War I that put the nib closer to the Gillott 604EF (though not as durable for thick ornamental penmanship shades) than to the present day pen which is closer to the 19th century design, so be careful in any pur chase you make. The Gillott 303 class of nibs. Left to right: Gillott 303, Gillott 404, Esterbrook 357, George Hughes 964, Hunt 22, Mark Ferth #4. Many fans of copperplate script find these pens ideal. Head of the class for most is the venerable Esterbrook 357, another in their Art & Drafting series. Nearly every copperplate scripsit I know covets this nib above all others. It has a superb fine point with excellent snap (Snap: the point quickly returns to shape after spreading.) and a great overall feel. The 357 is one of many reasons to mourn the passing of the Esterbrook Pen Company. One more excellent nib is the George Hughes 964, a rival to the 357 and 358 in every way. Hughes, once a Birmingham, England, company, merged into British Pens, Ltd., in 1961 along with Gillott, William Mitchell, Perry, and a few others. Only the Mitchell and Gillott names survive. The Hunt 22 is another fine pen in this group. At this writing, a slew of vintage 22s (ca. 1930) have come onto the market at fairly reasonable prices. Gillott has another nib in the 303 class, the 404. 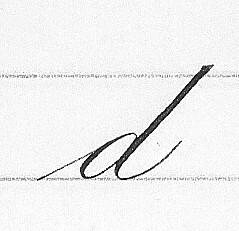 The latter is not as fine, but a good nib for copperplate. Like the 303, the modern 404 is blue. Another nib to consider is the Eagle Pencil Company #E370 College Pen. It is somewhat stiffer than the 303, but its extra fine point is an asset in small, delicate script. As with all pens, it will soften with use. One last nib is the Mark Ferth #4, a pen similar to the Eagle E370. The Gillott 170 class. 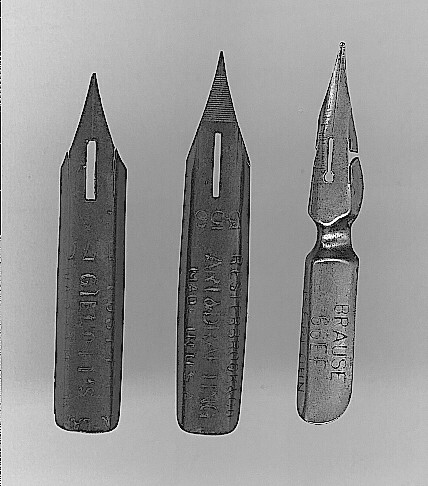 Left to right: The Gillott 170, Esterbrook 356, Brause 66EF. Ultra fine, very flexible, and smaller than the Principality, 604EF or 303, the 170 and others in this class are excellent for small copperplate and engrossers’ scripts. All require a delicate touch and are effective, but aren’t quite up to the challenge of the bold shades of ornamental penmanship. It will break. Modern Gillott 170s are blue. This is a small group, but another superb pen is the Esterbrook 356, part of the company’s Art & Drafting Series. I recently wrote over 100 small table place cards with the 356 in ornamental script and it was terrific. I was careful not to tax the pen with ultra-thick shades. The final nib in this group is the modern Brause 66EF. This is what used to be called an “arrow” nib for its unusual shape. Most arrow nibs were larger and much stiffer. The 66EF is a wonderful nib, well made with great snap and an extra fine point. Mapping pens. Left to right: Hunt 100, Hunt 103, Esterbrook 354, Esterbrook 355. Mapping pens are very, very small, smaller even than the Gillott 170 class. As their names imply, they were used in fine drawing, particularly cartography. They are mentioned here because there are some who like to write with them. I am not one. (For any time I could use a mapping pen, I’d prefer a crow quill. See following.) Besides being very small, they are incredibly flexible and don’t hold much ink. When I use them at all, I put them to work in touch up or fine cross hatching. Mapping pens can render an unbelievably fine hairline. Excellent mapping pens were the Esterbrook 354 and 355. The 355 has a much stiffer action. They are black in color and are of typically good Esterbrook quality. At this time, there seem to be a lot of them available on the open market. Hunt also made good mapping pens, the #100 and #103. Paper and Ink Arts (www.PaperInkArts.com, 800-7367772) and John Neal (www.JohnNealBooks.com, 800-369-9598) have both in their catalogues. Gillott 659 crow quill in a Miller Brothers straight holder (left) and the same nib in the PIA holder at right from Paper & Ink Arts. This is an interesting class of pens. The tubular crow quills can perform most, if not all, the functions of a mapping pen. However, they hold more ink and have a nice point that allows for good albeit tiny script in their traditional straight holder. To add to my interest in crow quills, last year Paper and Ink Arts introduced its own Paper & Ink Arts Adjustable Oblique Holder based on the Bullock design. Both the PIA and Bullock holders can handle virtually any size nib including the crow quill. 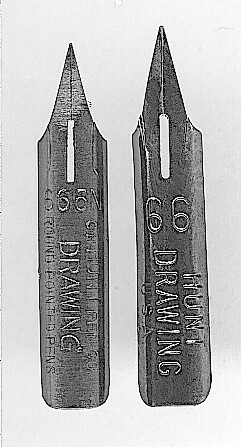 Heretofore, the only holders available for the crow quill (aside from custom holders) was a straight penholder, but with the Paper & Ink Arts holder, the tiny crow quill was in a position to write as other nibs in an oblique angle and thus needed a fresh look as a script writer. Crow quills had a variety of uses and, ironically, writing was way down on the use scale. They were used for drawing, fine retouching, etching on limestone printing plates (early lithographic printing plates, before photolithography, were made from limestone and very heavy). Architects and engineers found them very useful. It is not unusual to find crow quills with the names of technical firms such as Keuffel & Esser stamped on them. They are very flexible with little variation between brands and all have extremely fine points. I have found them easier to use than mapping pens in every instance. 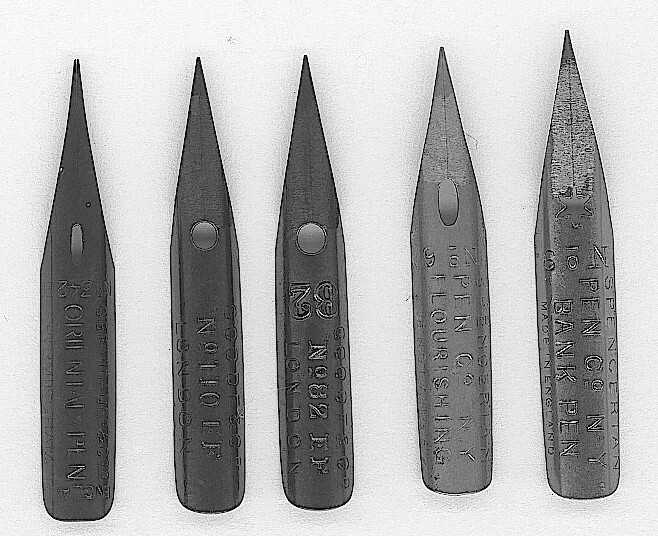 The major nib manufacturers all made crow quills and they are all of fine quality. The Hunt 108 and Gillott 659 are still made today. Beak nibs are characterized by long, stiletto-like extra fine points that resemble the shape of a bird’s beak. They range from flexible to very flexible and are quite good for a range of scripts. Their long tines and flexibility can create a super thick line that rivals even the Principality. There weren’t many made and I am not aware of any manufactured today. Beak nibs, so called for their long points that somewhat resemble the shape of a bird’s beak. Left to right: Brandauer 342 Oriental Pen, Goode & Company 110EF, Goode & Company 82EF, Spencerian Pen Company #6 Flourishing Pen, Spencerian Pen Company #9 Bank Pen. 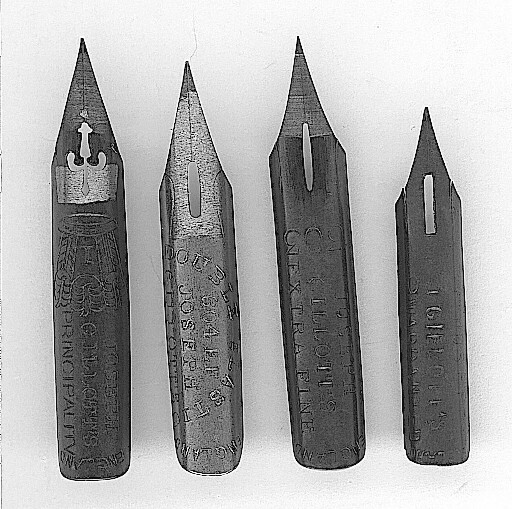 All of these nibs were made by Perry & Company. The Brandauer No. 342 Oriental Pen has probably the least fine point in this group and is the most flexible. A well-made nib, but takes some work to master. Goode & Company No. 82EF, an extremely fine point and quite flexible. I like this pen and use it frequently. Goode & Company No. 110EF may be a little finer than its 82EF counterpart, but just as flexible. A terrific pen. Spencerian Pen Company No. 6 Flourishing Pen. A fantastic pen, very flexible. It is similar to the Goode 82EF. Spencerian Pen Company No. 9 Bank Pen. Very similar to the No. 6, perhaps a little less flexible. The difference is negligible. This is a great pen. This is a category reserved for nibs 1.5 inches and longer. By contrast, the Principality and 303 are both 1 5/16” long and the 604EF 1.25” long. Not long ago, such a grouping would be unreasonable because long nibs did not sit well in ordinary holders. They forced the writer’s hand too far from the paper and could not be centered on the axis of the pen staff. Such pens were very awkward to use. The only hope was that a particular nib could be forced through the flange and the back end trimmed with a Dremel-type tool if it interfered with the hand on the penholder. In the last few years, there have been a number of thick-handled nib holders created for those with large hands. They also help to reduce fatigue while writing for long periods of time. The short Carrot Oblique, Turn of the Century (a thick version of the Century Oblique), and a thicker version of Mike Sull’s holder have suddenly made long nibs very viable. They allow the point of most nibs to be centered along the axis of the pen staff and are a pleasure to write with. The Esterbrook Pen Company made two very good long nibs worthy of consideration. The #135 Double Elastic is a medium point, flexible as the name implies and a superb nib. I have had success sharpening long nibs by running a piece of crocus cloth along each tine to narrow the point. It is a slow, painstaking process that is very rewarding as it turns a medium point into a fine point. The other Esterbrook long nib is the #14 Bank Pen. This long—almost 1.75 inch pen—is of a uniform length so that the back end may be forced through the penholder’s flange to center the point. It has a finer point than the 135, but it just as flexible. A great pen. The best known of this group is probably the Spencerian #2 Counting House Pen and it commands the most money on Ebay. It is flexible with a medium point that sharpens well and was a mainstay of the Spencerian Pen Company’s considerable line of quality nibs. Long and lean pens. Left to right: Esterbrook #14 Bank Pen, Esterbrook 135 Double Elastic Pen, Spencerian Pen Company #2 Counting House Pen, Blanzy-Poure Conte Gilbert 2552 Cementée, Perry 27 Extra Fine Elastic Pen, Brause 27EF Elastic Pen, Leonardt #40 Hiro, Brause 361. There are two excellent modern nibs still made today. Both are very fine and quite flexible. They are similarly “spoon”shaped with widely cut side slits that increase flexibility. The Brause 361 is 1/8” longer (1 5/8” overall) and is slightly less flexible than the Hiro 40, made by Leonardt of England. Leonardt is the last of the independent penmakers who did not merge into British Pens in the 1960s. Both are great pens. I’ve saved my two favorites for last. First is a French nib from Blanzy-Poure Conti Gilbert, the #2552 Cementée. It is a super fine, super flexible pen that can render the smallest hairline with a shade to challenge a Principality. At 1½ inches, it centers easily in a large penholder. This nib was made into at least the 1950s and it shows up on Ebay from time to time. My favorite of this group and one of my favorite nibs, period, is Perry & Company’s No. 27 Elastic Pen. I found a box of these on Ebay about three years ago and a photo of the nib with its long tines and extra fine point looked promising. As the only bidder (long nibs tend to scare bidders), I got a steal. With this nib it was love at first write and I contacted the seller to inquire about more. He had a considerable supply and I bought what I could. The Perry 27, which dates at least to the 1880s, has an extra fine point that I sharpen to an even finer point. The long tines make that an easy task. It is not quite as flexible as the Blanzy-Poure Cementée above, but it’s close. It can still render an incredibly thick shade. It may seem less than elastic at first, but loosens up considerably with just a little use. 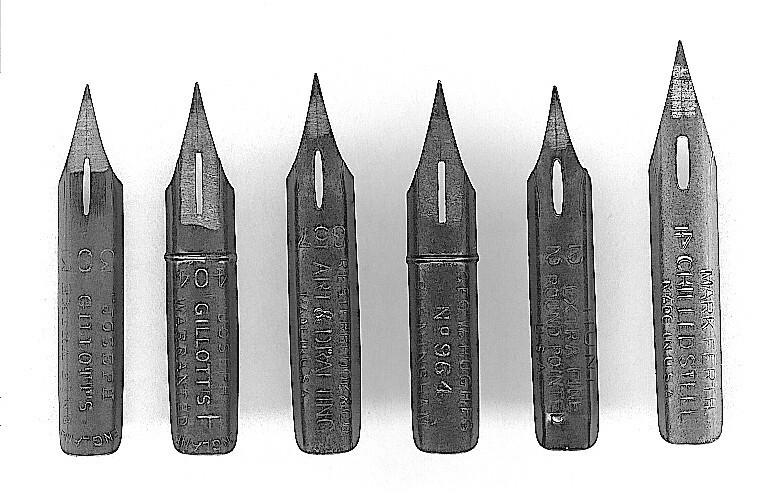 There is an imitation (Imitations of top selling nibs were very common among penmakers.) of the Perry 27 by Brause, which is coincidently called the #27EF Elastic Pen. It is identical is nearly every way except for a slight difference in the eye. Brause no longer makes their #27 and it may date from pre-World War II. Brause’s version of the #27 is an excellent pen.